A matched pair of Vintage, Pine bedsides. These have interesting original handles. 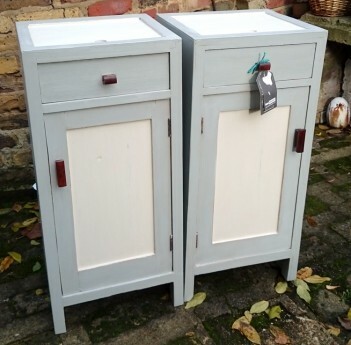 The units have been professionally stripped, then hand painted in Grand Illusions Vintage Paint using Shutter grey and Linen and then varnished (matt finsh). The interiors of the cupboard sections have been painted in Charleston green.